Cardston, Alberta--(September 13, 2018) - American Creek Resources Ltd (TSXV: AMK) ("the Company") is pleased to report on results from Tudor Gold's exploration at the Treaty Creek project located adjacent to Seabridge Gold's KSM in BC's Golden Triangle. Tudor has determined the potential quantity and grade ranges for gold mineralization encountered up to the completion of its 2017 drill program on the Copper Belle zone. Drilling is continuing in 2018 with the aim of increasing the known area of gold mineralization at Copper Belle by the end of this field season. Tudor Gold believes that exploration of the Copper Belle zone up to the end of 2017 has indicated the potential for 1.8 to 1.9 million ounces of gold contained within 50 to 45 million tonnes grading 1.12 to 1.35 g/t Au. This is based on previous exploration results, including 57 current and historic drill holes totaling 22,974 m. Thirty of the holes (15,424 m) were drilled by Tudor Gold in 2016 and 2017, with 27 holes (7550 m) completed by others in 2007 and 2009. Drill holes are generally spaced 50 to 100 meters apart. The exploration target potential was derived by modelling zones of gold-bearing porphyry style veining and alteration, including quartz-sericite-pyrite and potassic alteration, within a surrounding propylitic "halo", on vertical cross sections and long sections through the Copper Belle zone. 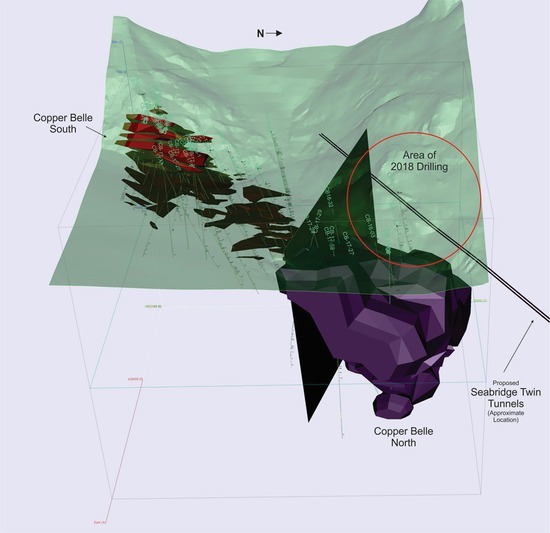 The ranges are based on drill results that define the approximate length, thickness, depth and grade of the Copper Belle zone. The volumes of the areas modelled on sections have determined the potential tonnage range, whereas the grade range is based on drill results within the modelled exploration target area up to the end of 2017, and on nearest neighbour and inverse distance estimates, within an interpreted 0.3 g/t Au grade shell. The potential tonnages and grades are conceptual in nature, there has been insufficient exploration to define a current mineral resource and it is uncertain if further exploration will result in the delineation of a current mineral resource. Walter Storm, President and CEO, stated: "We are extremely pleased with the indications for the Copper Belle zone to potentially host between 1.8 and 1.9 million ounces of gold and are looking forward to continued positive results from the 2018 drilling program that we are confident will significantly increase the known extent of the mineralized area at Copper Belle. The 2018 drilling program entails part of the company's plan to work towards preparation of a mineral resource." For further information please contact Kelvin Burton at: Phone: 403 752-4040 or Email: [email protected]. Information relating to the Company is available on its website at www.americancreek.com.